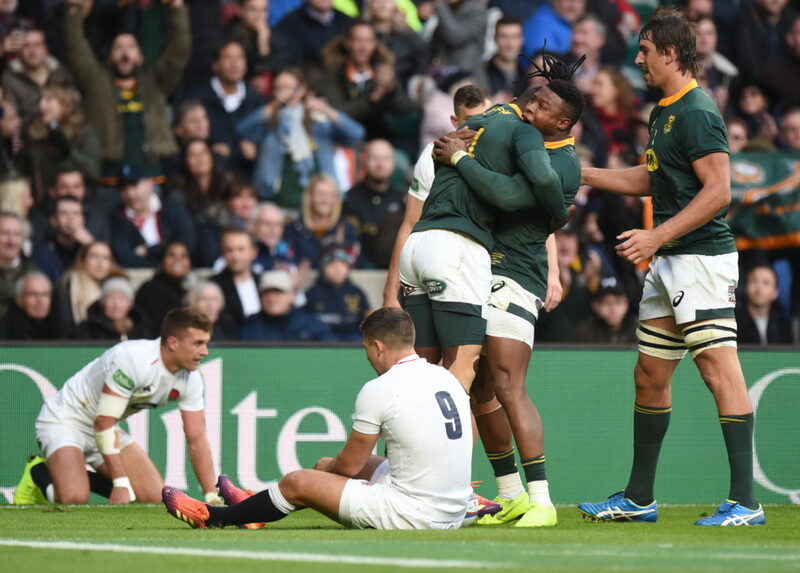 What NICK MALLETT had to say on SuperSport after the game between the Springboks and England at Twickenham. ‘The England defenders never got behind the last man’s feet [during the last play of the game] so that is offside, that is the touch judge [error]. There is also the possibility of a high tackle which was not called there. And then what was adjudicated not to be a shoulder charge by [Owen] Farrell. ‘I think it is the sort of decision that goes to the home team because they are leading. 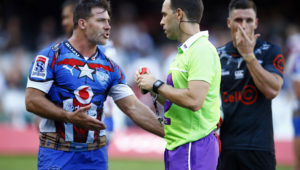 That looks to me like a shoulder charge to the upper body and he [referee Angus Gardner] says he [Farrell] wraps that right arm. In the studio, I would not say that was the fair decision. ‘I think every single viewer here realises that we shouldn’t rest too much on that endpoint because we still had to kick it over and unfortunately [Handré] Pollard missed one from in front of the poles. That was an opportunity. Four lineouts close to their line was an opportunity and we had a number of handling errors as well. I think we can look at ourselves as well as the referee today. ‘We managed to get ourselves in positions which we like, as South African teams. We put pressure on, forced penalties and managed to kick it into the 5m area to bring our driving maul into play. They had a yellow card, we were in the perfect position to take a ball at the back of a lineout. [Maro] Itoje was going up, but on three occasions [Malcolm] Marx pushed his throw – on four in fact. 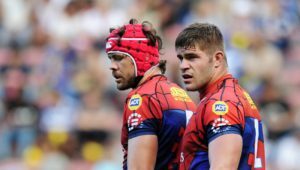 I think we can really say – a little bit like Western Province in the Currie Cup – if you don’t win your own lineout ball, you don’t deserve to win. ‘If they look at it again, he [Marx] will understand that he just does not have to push it so hard. There are very few teams that will contest five yards out. They might put one guy up but very few teams put two pods up because they have to defend the maul afterwards which means they have to get back to ground and defend to stop you scoring tries. You should not have a difficult throw there. You should be able to win that ball, you don’t have to push it, you can actually just keep it to where the guy can take it above his head really. It is a lesson that we have to learn but it is a very costly lesson today because we could have quite easily been up by two more tries at half-time. ‘If you look at Pieter-Steph du Toit, he is at full extension. You cannot lift him any higher. We are pushing the guy to his utmost and it is going so much over that. That is just too high, it is just a bad throw. You could have gone at least two feet lower and we would have caught that ball. 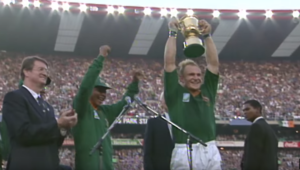 It is absolutely critical because if you choose the lineout, you have to win it. At this level, it is like missing a kick from in front of the poles. 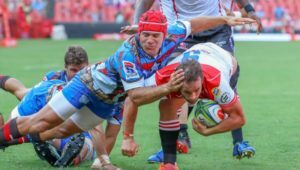 ‘Even with a couple of defensive errors caused by our wings who came in, we still have our scrumhalves getting across and they worked really hard. England did not score a try against us so they are not a particularly strong side. That is what was so disappointing. 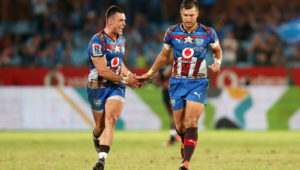 ‘I thought [Damian Willemse] was very good. The only mistake he made was to come up a bit early as a fullback. But I don’t think he missed a high ball today. He was so confident and had a lovely counter-attacking stepping. His defence was solid. The back three came through that baptism of fire very well. They were backed up by a very good pack of forwards that kept the ball away from the England backs. ‘With that injury [Damian de Allende] had, it took him a year to get back. He lost a bit of confidence in his ability to step, handoff and in his passing game. He was taking some poor decisions last year. This year, he has been much much better in Super Rugby. He played against [Ben] Te’o today, who is a big and physical player, and dominated Te’o. He played against Sonny Bill Williams in the last game against the All Blacks and you did not see Sonny Bill the whole game. I think Damian is coming into his own. He likes playing with Pollard and [Jesse] Kriel. ‘It is a very solid defensive line there which allows a little bit of leeway for the wings to come out of the defensive line. If someone comes out of line and misses, they shift incredibly quickly across. They have got good pace, Pollard caught Jonny May when he broke and cut back inside. Even our flyhalf is getting across to cover defence and scramble.